This course will certify the student to service, neutralize, and repair GSA approved security containers and vault doors. The Department of Defense and other federal departments are moving toward making this certification a requirement for anyone performing almost any type of service on these containers, including periodic preventive maintenance inspections. Please note: This course is open to U.S. citizens only. Click on the "Learn More" link below for additional renewal options. Individuals successfully completing this training program will be authorized by GSA to inspect and recertify GSA containers. Please note: These courses are open to U.S. citizens only. This class will give the student an extra advantage when taking the GSA Approved Container Inspection course and is typically scheduled the day before the inspection course. The first step in inspecting a GSA container is identifying it. Even if you have worked with GSA containers for years, there is always more to learn. This class will help fill in the gaps between what you know or think you know. This factory authorized certification course provides in-depth training for installation, operation and programming of the X-10 lock and presents the differences between it and the X-09. Students will be taught to install the X-10, set up the lock in various modes of operation, change combinations, recognize and clear error conditions in the lock, auditing procedures, and basic troubleshooting. The Sargent & Greenleaf model 2740 safe lock was designed to meet Federal Specification FF-L-2740 and is approved for use in protecting our nation's classified materials. The manufacturer requires that technicians successfully complete this approved training program to be listed in their 2740 recommended technician database. Proper opening and repair of GSA containers is essential for retaining GSA approval. This class teaches methods for opening and repairing GSA security containers authorized by Federal Standard 809. This class was designed to give the participant a solid background in servicing and troubleshooting mechanical combination safe locks. 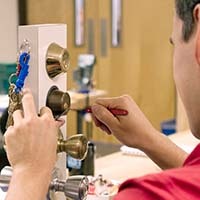 It is ideal for both beginning and intermediate level locksmiths and safe technicians. In the extensive troubleshooting section, the student will learn how to deal with a wide variety of both common and unusual lock problems. 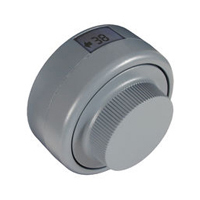 Love them or hate them, electronic safe locks are encountered in ever increasing numbers. 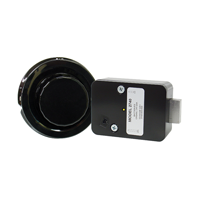 In addition, model numbers and features are continually changing with little advanced notice from manufacturers. This new class is designed to present you with up-to-date information on current production locks. Programming, troubleshooting, plus drilling and bypass methods are thoroughly covered for today's most common locks. Join the ranks of our industry elite by learning the skills needed to open safes like an expert. Drill site selection, dial removal, drilling apparatus, drill bits, inspection lights, borescopes, number transferring, relock triggers, emergency dials and more are covered in this class. You will go home with the skills and confidence needed to grow in this profitable field. This class was designed to give the participant a solid background in servicing safe deposit locks. There are hundreds of varieties of locks in use in countless banks, hotels, and other businesses across America. It might take years to really master time locks, but we have taught scores of people to be comfortable with the basics in only one day! You will not be a watchmaker at the end of the class, but you will be comfortable correcting overwinds, servicing and synchronizing cases, and understanding the fundamentals of ultrasonic cleaning. This course has been designed for those that would like an effective method of decoding pin and disc tumbler locks without having to take them apart. You may find that your training needs cannot be met by our regularly scheduled classes. Schedules may conflict, or you may require training in topics not covered in our standard courses.